Card of the Day ~Use Your Natural Healing Abilities~ Since God is the ultimate healer and you are God’s creation, you have natural healing abilities that can benefit your health (as well as the health of others). 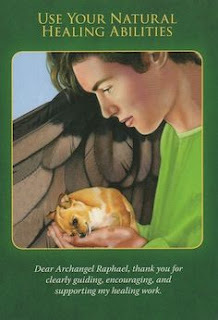 This card is Archangel Raphael’s way of urging you to work with your own energy, spirit, and thoughts to effect healing. Your strong desire for renewal and restoration is a powerful remedy and treatment. Raphael may guide you to take classes, read books, or conduct healing sessions. He’s also the angel who pushes healing related books down from bookshelves, so if one happens to fall at your feet, this is a sign from him. It’s important to follow Raphael’s guidance and leads, as healing often occurs when human action partners with the Divine. You will be amazed at everything you are capable of doing. Have a wonderful day. I love you all!